Double X Science: How helpful are dense-breast right-to-know laws? A doctor reviews a digital mammogram, pointing to a possible cancer. 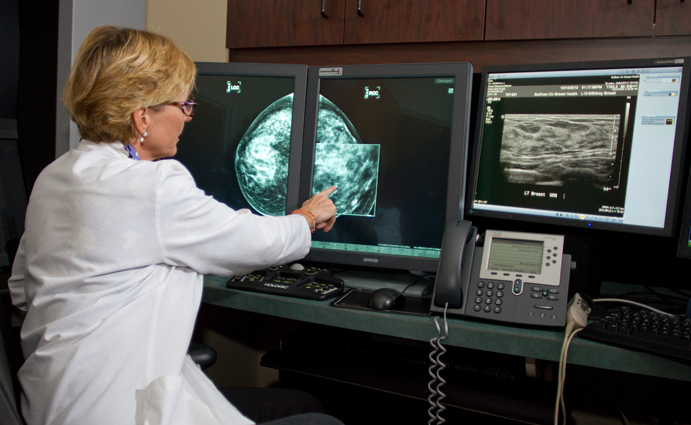 § women may benefit from additional breast cancer screening. The California law goes into effect on April 1, 2013. It follows four states (Connecticut, Texas, Virginia, and New York) with similar statutes. All have enjoyed solid bipartisan support. Rarely do naysayers or skeptics speak up. Young women who are leading the charge often bring lawmakers the story of a young constituent, diagnosed with a very aggressive, lethal cancer that was not shown on film-screen mammography. The Are You Dense? patient advocacy group engages patients on Facebook, where women share their experiences with breast cancer, organize events, and lobby for legislation. Individual radiologists work with the advocacy groups, but many radiology groups and breast surgeons do not endorse these laws. A study of more than 9,000 women in the Journal of the National Cancer Institute revealed that women with very dense breasts were no more likely to die than similar patients whose breasts were not as dense. “When tumors are found later in more dense breasts, they are no more aggressive or difficult to treat,” says Karla Kerlikowske, MD, study coauthor, and professor of medicine and epidemiologist at the University of California San Francisco. In fact, an increased risk of death was only found in women with the least dense breasts. Even though the “Are You Dense?” campaign has been instrumental in getting legislation on the books across the county, other advocacy groups and patient advocates want research, enhanced patient literacy about risks and benefits of procedures. Many recall mistakes made that led women down the path of aggressive procedures. In that group is the radical Halsted mastectomy, used widely before systematic study, but once studied, found no better than breast-conserving surgery for many cancers, and bone marrow transplants, also found to be ineffective, wearing, and costly. Eve Harris @harriseve, a proponent of patient navigation and patient literacy, challenged Peter Ubel, MD, professor of business administration and medicine, at Duke University, on his view of the value of patient empowerment on the breast density issue. In a post on Forbes, replicated in Psychology Today, Ubel argued that in cases where the pros and cons of a patient’s alternatives are well known, for example, considering mastectomy or lumpectomy, patient empowerment play an important role. “But we are mistaken to turn to patient empowerment to solve dilemmas about how best to screen for cancer in women with dense breasts,” he writes. But evidence and literacy take time, don’t make for snappy reading or headlines, and don’t shore up political points. Can we stop the train towards right-to-inform laws and make real headway in women’s health? Can we reallocate healthcare dollars towards effective treatments that serve patients and engage them in their care? You have to wonder.